It was 2013. Tim wasn't playing out with us anymore and none of us were getting together to session very often either. 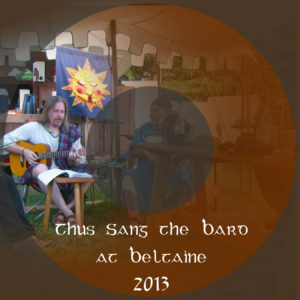 I was worried that Bardic Circle was over (turns out it wasn't!) and I just wanted to get a bunch of the songs I'd been working on out to folks. I decided that I would no longer burn CDs and hand them out at events, but instead I'd upload the files somewhere and send a link to them to download them. I wasn't really happy with the recordings, and most of the tunes had been recorded quickly and without a lot of attention to detail. Still, it served the purpose which I've been aiming for all this time - to fix that period of time in my memory with a collection of the tunes I was working on then.